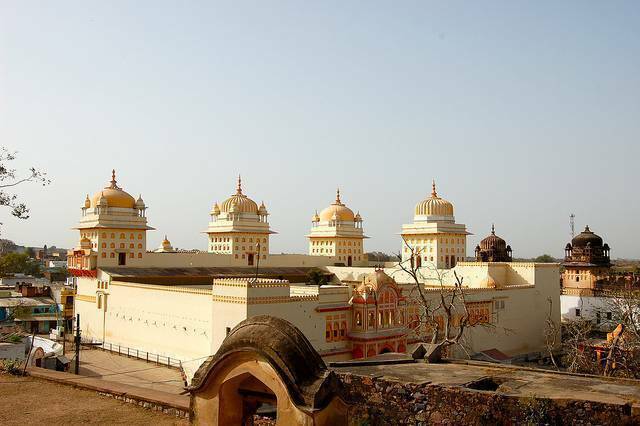 The Ram Raja Temple is very auspicious temple where Lord Rama is worshiped in Orchha. Legend has it that it’s built where queen's palace used to be. When Lord Ram's idols were being taken to be placed in Chaturbhuj temple, idols refused to move. Therefore a temple was built around the idols. This temple when open is usually thronged by devotees. Temple has a marbled courtyard and decorated in pink and yellow colors. The most attractive of all the things of the temple is the idol of the Rama surrounded by Sita, Hanuman and his brother. Millions of people from surrounding come to this temple to celebrate the birth of lord Rama. Vivah Panchmi is a festival celebrated in the month of November. It is a festival where the marriage of the Sita and Lord Rama makes the temple colorful.